Here’s some fun facts about the area of the Underwater Sombrero book project! The Sombrero Key Lighthouse is located on Sombrero Key about five miles south of Vaca Key, home to Marathon Florida. The name Sombrero Key goes back to the Spanish, and old charts show a small island at the spot, but by the later 19th Century the island had eroded away and all that remains is some parts of the reef exposed at low tide. As a result, the reef and the lighthouse have also been called Dry Banks. The lighthouse was put in service in 1858, automated in 1960, and is still in operation. The foundation is iron pilings with disks, and the tower is a skeletal octagonal pyramid of cast iron. It is 142 feet tall and is painted brown. It has two platforms. The lower one, 15 feet above the water, held water and fuel tanks, the generator (after the light was electrified), boat hoists and a workshop. The upper platform, 40 feet above the water, held the quarters for the staff. The original lens, a first order Fresnel lens, is now on display in the Key West Lighthouse Museum. 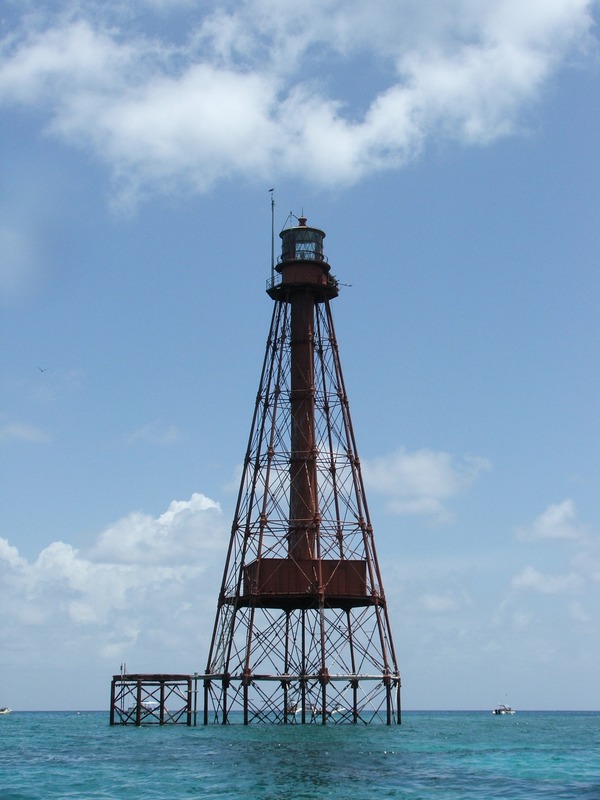 The Sombrero Key Light is the tallest lighthouse in the Florida Keys, and was the last lighthouse constructed under the supervision of Lieutenant George Meade of the Bureau of Topographical Engineers. The reefs featured by the Underwater Sombrero book project are located to the south and east of the lighthouse.